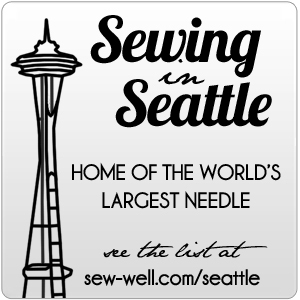 I love staying connected with each of you, and I'm writing to remind you that I am still around, writing about sewing. However, like Kyle, you'll find me on Instagram (@gyldenege or @mistyvalleymystics) these days doing what many consider microblogging, a few sentences or a paragraph along with a photo or two. This has been a difficult year at times, a relationship ended that left a profound impact on my heart. I pulled away to spend as much time in nature and sewing as I could. Sewing is my therapy and nature soothes my soul. I posted many a photo of my summer evenings spent swimming in the cool salty waters of the Puget Sound. And this year has also been filled with so much joy, friendship, community, and travel. Plastic-free July helped spurn me to make changes in my grocery purchases and how much single-use plastic I purchase and use. A group of 5 of us painted and opened, The Ethereal Temple. I got to listen to Mirna read from her book and meet with Brooks Sports and the pattern makers for REI at the Less Labels, More Sizes trunk show where REI revealed it is stepping into the plus-sized market. What a thrill! I even got to take a workshop from my favorite bio-mechanist, Katy Bowman. I wouldn't change a thing. The last several years have been an unfolding and discovering who I truly am, not who I think people want me to be for them. I don't believe we can maintain a life lived for others if we do not choose to live it for our own purposes first. This might sound selfish, but if you do not put your own oxygen mask on first, how do you live a happy, healthy life where you can serve the greatest good of all? One of the challenges I have been wrestling with is where to go with my sewing, how much time to spend writing about it vs. how much time devoted to doing it. The more I think over the years of blogging, the more I recall how happy I was doing my personal challenge of sharing my dance halloween costume of the Goddess Nike from design through dancing in it. Likewise, if you followed me through October 2018, I just adoreddrawing for Inktober using Camille and Drawlloween prompts. This has lead me to realize that I am a project or challenge based person. I thrive on cycles, much like nature. I prefer to devote myself to a cause that has a definitive end which allows me to ramp up and down, effectively having my own seasons. I work deeply and I enjoy it. Deep work also demands deep recovery and review. The beginning of a project is the dream time, the winter. That is when the idea is coaxed into being, germinated and must break through the soil. Then, begins the joyful, devoted work of growing, blooming, and bringing materials into form, such would be spring. When the project is in full bloom or ready to harvest, that would be where my energies would thrive much like harvesting a field or gathering nuts for the winter. And finally, there must be an end, a winter where we give thanks for what was and mourn the end of such a glorious project. Often in our current society, grief and mourning are shameful and hidden. However, I believe that if we do not honor what was and allow the grief to work through us, to finish out and release, like the decaying of leaves, then we miss out on the potential that the decay will fertilize our future projects. There is a reason the humanity honors the cycles of the year. And I for one, must honor that I am as cyclical as the sun, the moon, the stars and our beloved planet. Some of you may have read my dreams of starting a sewing business over the years. Others have heard me hint at writing books. I've toyed with designing patterns, and even in-person teaching above and beyond this blog and other articles. I have a feeling once I honor my nature by sharing here with you, I can make new commitments to myself and set new sewing goals. It's important to release those UFO's that aren't working, to put-to-bed the projects that aren't profitable, and to clear away the clutter. And so, because I must align with nature to feel more at home with myself, and in being fully myself, I honor my own nature of cycles and time-banded projects, I will share with you as I choose to take on a challenge that I feel will add value to your world and mine. In the spirit of cycles and projects, I'd like to share my next big endeavour: A Wetsuit. My summer endeavors have left me wanting to swim, no matter the weather here in the Pacific Northwest and no matter that our waters are roughly 50F year round. I did swim in it this September and met a lovely new friend who delighted in my new Jalie swimsuit and Espresso leggings. She wanted to recommend my garment maker to her tri-athlete niece! Can you believe that? As a teaser, here's a current project I'm nearly done with. I needed to grade up just a smidge as a couple injuries have kept me from being active this year and I've gained a little weight. Can you guess what it is?